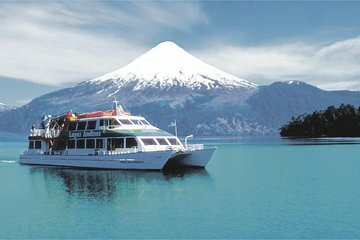 Explore the natural wonders of Chile’s Lake District on this full-day tour from Puerto Varas to the Vicente Perez Rosales National Park. Pass through towns like La Poza, Ensenada and Peulla; admire the Petrohué Falls (extra cost); and cruise across the Todos los Santos Lake in a catamaran. After a delicious 3-course or box lunch (depending on option selected), choose from optional activities like hiking, kayaking, horseback riding or a 4WD safari, and enjoy the park’s scenic rivers, forest valleys and soaring cliffs. Incredible sights to see all around on the lake, beside the shore and into the Andes. Waterfalls, snow on volcanoes, an island, and a beautiful lake.